Lifestyle change is a topic that comes up often in our nutrition classes. We are told that if we are going to help people with life threatening illnesses we have to be able to counsel and guide them to make positive lifestyle changes in the areas of diet, exercise and stress management. I am not disputing the validity of this statement. It has been shown that making positive lifestyle changes in your eating habits, level of physical activity and stress level can have a dramatic impact on your health and well-being. The Cleveland Clinic opened a Wellness Institute in 2008 after 25 years of research showed that “lifestyle changes can reverse chronic conditions such as obesity, diabetes, cardiovascular disease and some early cancers”. The institute offers nutrition counseling, cooking, yoga, fitness and stress management classes. To date, they have helped over 700 participants suffering from chronic disease. Lifestyle changes work, period. The big question is how do you successfully make lifestyle changes? We are all busy people who are juggling a lot of obligations: school, work, family, friends and other extra-curricular activities. A lot of what we do when it comes to eating and physical activity is a result of habit. Some of those habits are good like eating a piece of fruit with lunch every day and some are not so good like running to the vending machine for a sugary snack to beat an afternoon slump. It would appear that making lifestyle changes really boils down to replacing our bad habits with good ones. Easy, right? Charles Duhigg, author of “The Power of Habit” says that in order to break a habit you must understand the structure of habits. He asserts that habits have 3 parts: a cue or trigger, a routine (the actual behavior) and a reward. When you know what the cue or trigger is you can be on the alert to replace the bad habit with a better one. Let’s go back to the trip to the vending machine every afternoon. The trigger might be you are tired or you are feeling stressed. The behavior is getting a candy bar. The reward is you feel better albeit for only 20 minutes or so because you are going to crash from the sugar high sooner or later. When we are aware of the trigger we can substitute another behavior like eating a healthy snack like some raw vegetables and hummus or we can go for a 10 minute walk, do some yoga stretches or a deep breathing exercise. Reward? We feel better not to mention virtuous. “Most bad habits are caused by stress or boredom” says James Clear who writes a health and wellness column for the Huffington Post. He suggests that you can plan ahead of time how you will respond to stress and boredom by choosing a substitute behavior, cutting out the triggers or teaming up with a friend. This sounds good but we all want results now. How long is this habit change going to take? The myth is that habits are formed in 21 days. This idea may have had its genesis from a popular self-help book written in the 1970’s by Dr. Maxwell Maltz, a cosmetic surgeon. He found that it took 21 days for amputees to stop feeling phantom pain. He went on to say that new habits could be formed in the same amount of time. The reality seems to be that it takes longer than 21 days to form a new habit or break an old one. In a study done by Pippa Lally from University College, London, it was shown that it takes at least 66 days for a new healthy habit to feel automatic. We also know that in order to be effective a lifestyle change must be just that, a change that you incorporate for the rest of your life. If I am going to counsel other people on making lifestyle changes I need to know firsthand what it means to make a lifestyle change. I have decided to be my own guinea pig when it comes to experimenting with lifestyle change. Over the next 9 months I am going to lose 5-10% of my current body weight by making positive lifestyle changes. Those changes will include eating more vegetables, drinking more water, cutting back on junk food, alcohol and caffeine and decreasing portion sizes. I currently eat a lot of fruit, do not drink soda or eat a lot of meat. I will also incorporate weight training and yoga into my fitness routine. Right now I run or use the elliptical 4-5 days a week. In the coming months I’ll report my struggles and triumphs, what has worked and what needs more work. I will report my weight loss in percentage form--you didn’t really think I was going to tell you how much I weigh, did you? If you are interested in participating in this unofficial experiment please reach out to me. I welcome your feedback, suggestions and support. Let the games begin! 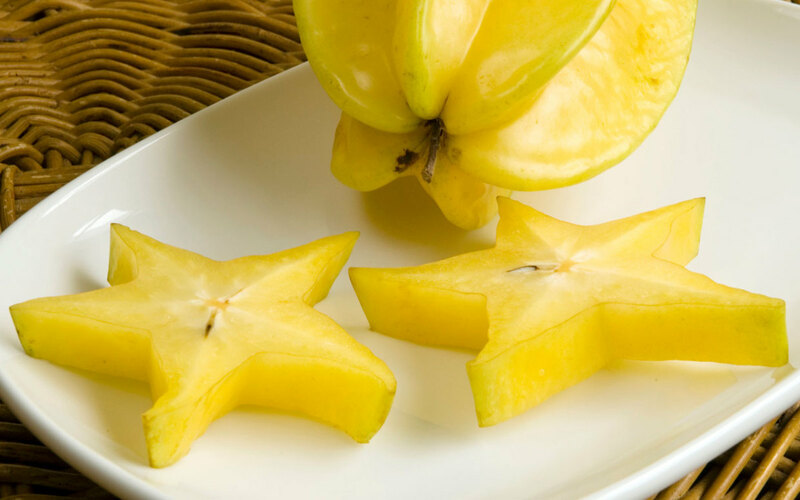 Starfruit (or Carambola) is a mysterious and beautiful fruit that is a part of many cultures and serves as proof that things are not always what they seem. On the outside, it is somewhat awkward looking and shaped completely different than anything else in the produce section. It is of yellow/green color on the outside and almost appears to be composed of several orange segments aligned in a weird way. You are in for a surprise though; this fruit can be quite sweet and it looks exactly like a star when cut open (thus the name). Likewise, its popular worldwide and has several interesting medicinal uses in other countries. The exact origin of this fruit is unknown, although it is thought have originated in Ceylon and the Moluccas (India and Indonesia). For centuries, it has been growing in Southeast Asia and Malaysia, it now grows in southern China, Taiwan, and India as well. While those are the typical growth- locations, its popularity extends past this region and throughout the world! 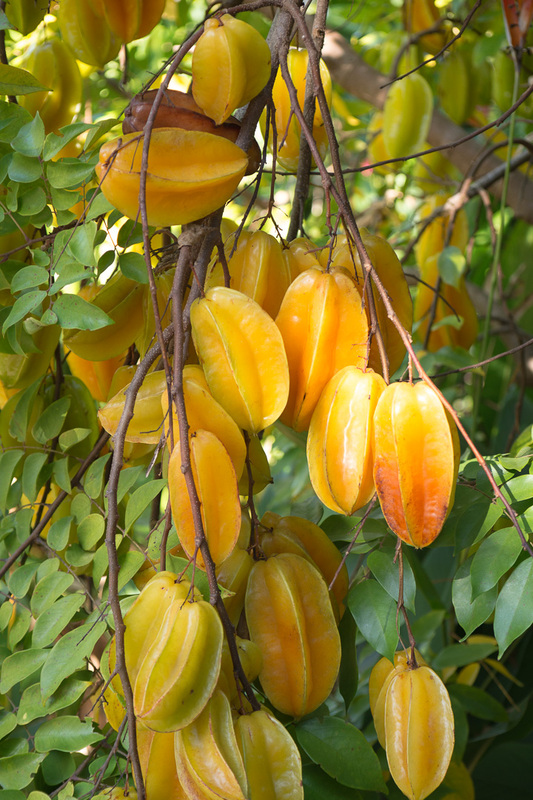 Starfruit is beloved in the Philippines, Queensland, Australia, and some of the other South Pacific islands; Tahiti, New Caledonia, the Netherlands, New Guinea, Guam and Hawaii. Despite being a part of many people’s everyday life in Asia, its reputation in the United States continues to be that of a rare, uncommon and unusual fruit. Why is this? Could it be we just don’t know how to prepare it in a delicious way? There are infinite possibilities of how one can incorporate Starfruit into their diet. It can be eaten plain, used as a salad garnish, cooked in a pudding or curry, pickled or made into a jam, or dried. It can even be juiced- in some countries Carambola juice is served as a refreshing beverage, perfect to cool you down on a hot day. As you can see, there are no limits when it comes to Starfruit. It can be eaten or prepared in every way imaginable and its benefits can extend to every part of the body. Here is a breakdown of its nutritional properties, followed by a tasty recipe that can be made at home. My passion for nutrition began with my own weight-loss journey and continues with a strong desire to help others. That desire inspired me to get involved with an on-campus healthy weight management group that is now called BetterWeigh4Life. I started working with them a couple years ago when it was called Strengthened@Auraria. It has been an invaluable experience as I work with Dr. Cyndi Dormer (she teaches the Weight Management and Nutrition Counseling) and other student interns. We started out as a program that worked alongside Campus Rec and offered nutrition counseling and group workouts. We are now focusing on presentations and group discussions in addition to one-on-one counseling. Along the way I have been privileged to get to know various clients who are all unique individuals struggling with different issues as they try to get healthy and reach a weight and body composition that they are happy with. I’ve learned so much working with this program, the biggest thing is probably that as a counselor I have to listen, listen, listen and keep listening. It’s so tempting to just tell people how to lose weight, especially for me, since I’ve personally lost almost 200 pounds. But that isn’t how you help people lose weight. Every person has to discover their own path and as their BetterWeigh4Life nutrition counselors, we enjoy the privilege of traveling that path with them. Participants of our program come to realize the why’s and how’s of their weight gain, and learn to turn it around and start a new trajectory towards health and wellness. If you have a passion for weight management, Resource Manager Susie Speer and I personally invite you to become an active member of our group. Nutrition students enrolled in the Human Nutrition & Dietetics curriculum at Metro State University of Denver have an opportunity to gain hands-on experience and provide nutrition counseling through our Auraria Campus weight management program; BetterWeigh4Life . As a member of our program, you can help educate clients on nutrition basics, encourage physical activity and a healthy lifestyle, and guide goal-setting through discussion groups, presentations and special events such as cooking classes and Kitchen 101 sessions. BetterWeigh4Life also offers individual nutrition and motivational counseling to our clients. Interested volunteers should either have completed or be currently enrolled in the Weight Management course and/or the Nutrition Counseling course, as offered by the MSU, Denver’s Human Dietetics’ curriculum. Exceptions may be made for relevant life experience, dependent on an interview. There are also opportunities for marketing and website construction and web-hosting available. Future members are encouraged to contact either Susie Speer at susiespeer62@gmail.com or Anita Leslie at aml317537@aol.com by September 1, 2014. Please reference “BetterWeigh4Life volunteer” in the subject heading of your email. Thank you for devoting some of your time and attention to learn about this important student-program. I am a Human Nutrition-Dietetics student at Metropolitan State University of Denver, pursuing my degree and hoping to become a Registered Dietitian. My personal story is that about five years ago I weighed almost 400 pounds, was sick in bed and on over 20 medications. Diet and exercise, as well as lifestyle changes, including regular chiropractic adjustments, were all part of my transformation. I have lost almost 200 pounds and want to help other people discover their motivation to get healthier and feel better.